While I’m busy making other plans for aesthetic awesomeness and cultural dominance, clay unfailingly reminds me to cleave to patience and humility. To aim high, show up in the studio, stay the course and remain grateful for it all: those bedrock opportunities for excellence. The piece pictured above, the thoroughly cracked Thistlethwaite and Haste, has given me once again an ironically humorous lesson I guess I am doomed to repeat to the extent that I become happy about it. This re-decorating and re-firing should have been a slam-dunk. I was just adding a fillip or two to a relatively plain piece from last year. It’s something I have done successfully many, many times before, whether as a subtle touch-up or a complete re-do. Because an important part of my new artistic direction is to make my own brands, logos, slogans and tag lines, I delved deep on the design details and the painting, set it in the kiln, fired it to a ridiculously low temperature compared to where it had already gone…and… opened the lid to an unequivocal failure. As best as I can figure, there were stresses hiding in the clay. Where, how and why are perhaps unknowable. Maybe they were always there. Was it due to forming issues? (But why didn’t they show up at the first higher temp firing?) Was it between the tensions of inner and outer surface treatments? (Hmmmm.) The relative speed of the kiln temperature changes? What? While it is good to suss out the reasons for problems, sometimes – OK, often – they just are the way they are…Shrug and go on. Yet, yet…..The meaning of that title…..
Was there Haste involved? Impatience? Imperiousness? Maybe. 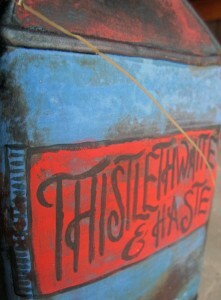 The clay and the kiln both replied: Thistlethwaite. Sigh. It’s almost a Jungian dream message. 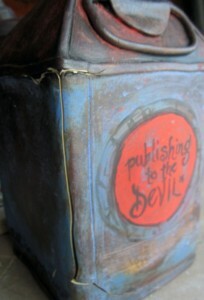 More evil sproing cracks and that tag line: publishing to the DEVIL. To do so is to reveal your fond intentions to the wrong person or at the wrong time. Wait, could that mean me? I’ll take it as a kicker, for I think the kiln genie was definitely out dancing with the ghost in the machine this time around. I will certainly remake this piece in some fashion, maybe a bit more intentionally, with love and laughter. Its ironic title and all the extras I added around the sides make me chuckle, even with those cracks. And that is exactly the Success part of this Failure I am most happy about. –Liz Crain, who realizes that speaking of all this here may or may not help the Devil calm down and just go along with her plans.